Bake delicious and nutritious bread in varying sizes in your own home with the stylish and functional Gluten Free Bread Maker. Offering 17 programmable settings for different types of homemade loaf, including a gluten-free option as well as jam and yoghurt, you can create delicious homemade bakes for all the family. The automatic nut dispenser allows you to add further flavour to your bread, whilst a 15 hour programmable delay timer and 60 minute keep warm function means you can enjoy your bread whenever it suits you. Touch screen functionality makes the bread maker extremely easy to use and a viewing window allows you to watch your bread as it rises. It's amazing!!! It cooks perfect gluten free loafs and I would 100% recommend it. So far so good. I tried it twice, machine works absolutely fine. it's more about mixing the right quantity of ingredients. My second try produced a very fine bread. Ordered 2 times, got the payment through and next day money returned with no warning. Unfortunately don't know how good is it, had no chance of buying it. Really good bread maker. Allows you to add ingredients like nuts seeds etc for speciality breads without opening the lid. It makes different sized loaves and you can use it to make the dough so you can make your own rolls. You can use the timer to delay the bread and wake up to fresh smelling bread or finish as you arrive home from work. It is a good quality machine and I would thoroughly recommend it. Only used it once so far! Trial and error time. My loaf was a good colour and had a nice crust. We’ve nearly nearly finished it! We hope to try other recipes soon. It is very good. The bread I made was nice and soft and delicious. This really is the best Bread Maker I have used, been making my own bread for 10 years. This is in a different class. Cant wait to try the Yogurt recipe as my other bread makers would not do this. I love my Tower breadmaker. Stylish looking, easy to use, perfect size loaf, easy to clean and very quiet. Competitively priced too. I highly recommended this product. Superb breadmaker. Have so far used programme 1, using half wholewheat flour to strong white, and am trying a brioche recipe using the sweet bread setting while I am writing this review. Can't wait! When homemade bread gets a couple of days old it is lovely toasted and we always finish the whole loaf. So much nicer than shop bought, and a lot cheaper if you buy supermarket own bread flour. This is a neat and tidy breadmaker, similar inside to most of the others, with a good digital menu. I do have to stand on my toes to see over the whole menu - won't be a problem if you are taller than me. The baking tin is the standard one for breadmakers, and easy to lift out and slot back in. The appearance is sleek and elegant, and feels solid and well finished. I wanted a quick bake and a dough function, and this had both.\n\nIt took some getting used to after my 20 yr old Panasonic. I am not a novice beadmaker by any means, but this made me feel like one - the order of ingredients is different to my previous one, for a start. And it's tricky to adapt quantities for different recipes.\n\nThe instruction booklet is not very easy or comprehensive (I found a better one that goes with the Andrew James version of this machine and printed off the pdf).\nThere has been a fair bit of trial and error involved - the first few loaves went in the bin: overflows, bricks etc. Plus I even managed to throw away the paddle because it was so embedded in one brick! That was totally my fault for not paying attention, and I got another one fairly quickly online. \n\nHaving said that, the bread is definitely not the same as I was used to from the old machine, but am slowly getting used to it's quirks - like the nut dispenser dropping wholesale into the mix, because it wasn't clear to me just how it was to be fixed in place. I now leave it out altogether. Nor do I particularly want to be opening up to scrape dough down between kneads, but that might be more for the stickier mixes.\n\nI like the viewing window, and it's easy to turn on the light - but why, why, why dim the display? It has to be turned on each time I want to see progress and elapsed time.\n\nOverall, I will be using this with more confidence as we become better acquainted and used to each other. This is a neat and tidy breadmaker, similar inside to most of the others, with a good digital menu. I do have to stand on my toes to see over the whole menu - won't be a problem if you are taller than me. The baking tin is the standard one for breadmakers, and easy to lift out and slot back in. The appearance is sleek and elegant, and feels solid and well finished. I wanted a quick bake and a dough function, and this had both. It took some getting used to after my 20 yr old Panasonic. I am not a novice beadmaker by any means, but this made me feel like one - the order of ingredients is different to my previous one, for a start. And it's tricky to adapt quantities for different recipes. The instruction booklet is not very easy or comprehensive (I found a better one that goes with the Andrew James version of this machine and printed off the pdf). There has been a fair bit of trial and error involved - the first few loaves went in the bin: overflows, bricks etc. Plus I even managed to throw away the paddle because it was so embedded in one brick! That was totally my fault for not paying attention, and I got another one fairly quickly online. Having said that, the bread is definitely not the same as I was used to from the old machine, but am slowly getting used to it's quirks - like the nut dispenser dropping wholesale into the mix, because it wasn't clear to me just how it was to be fixed in place. I now leave it out altogether. Nor do I particularly want to be opening up to scrape dough down between kneads, but that might be more for the stickier mixes. I like the viewing window, and it's easy to turn on the light - but why, why, why dim the display? It has to be turned on each time I want to see progress and elapsed time. Overall, I will be using this with more confidence as we become better acquainted and used to each other. Excellent product, very easy to operate. Had small issue with removing the paddle after use, quickly resolved after a search online. Nice looking product and simple to clean. Have recommended to colleagues. Only used for the first time today, seems to have turned out fine after some struggling to find a recipe to use as the instructions with the machine we found to be inadequate, and purchased a recipe book from another company. Easy to operate, could have been cheaper, bought one a few years ago which did the same job for about £40.00. Makes excellent bread, even works with recipe from my old bread maker, you just cannot beat your own fresh bread, nothing to beat it. great quality and value for money.\ni use it every couple of days and it makes great bread.\nThe nut/seed dispenser is very handy.\n i love it! i use it every couple of days and it makes great bread. The nut/seed dispenser is very handy. This bread maker has loads of settings (17 in total) to make different sorts of bread, dough, yoghurts, jam, etc.\n\nSo far we have only made pizza dough and breads in it but all have turned out perfectly. The display tells you exactly what it is doing and it looks good to boot. This bread maker has loads of settings (17 in total) to make different sorts of bread, dough, yoghurts, jam, etc. So far we have only made pizza dough and breads in it but all have turned out perfectly. The display tells you exactly what it is doing and it looks good to boot. 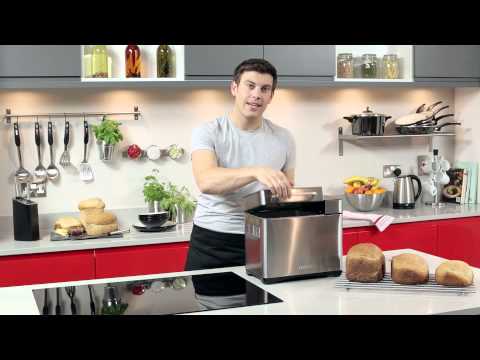 Tower Gluten Free Digital Bread Maker with Nut Dispenser is a great little machine! We've used various brands of breadmakers daily for the last 16 years, so are fairly experienced! On the whole we're very pleased with our first Tower breadmaker. It makes a lovely loaf, though you do have to tweak the recipe to get it to your taste (the recipe in the book is SO sweet!). Don't be discouraged if your first attempts aren't great, you soon get the hang of experimenting with the salt, sugar and yeast to get it perfect. I use much less sugar, a bit more salt and more yeast. My main complaint is that the instruction book supplied is USELESS. No information whatever on what each programme does etc. Tower need to address this urgently. The display screen is great, very touch-sensitive (and by the way, the book won't tell you, but if you press the + and - buttons simultaneously, it puts a light on in the machine so you can check your dough without lifting the lid - very useful.) My absolute favourite feature is that it lets me use the dough programme on the delay timer which hardly any other machine on the market does. (I like to have my dough ready for me when I get home, which is why I couldn't buy that big brand beginning with P!!) The fruit and nut dispenser works but isn't much use because it's so small it doesn't even hold half a cup of ingredients, so you still have to add them by hand. Be aware that the machine struggles to mix more than 3 1/2 cups of flour ( I was used to using a 4 cup mix for my dough) which is a bit disappointing. However, on the whole it does what I need it to, and I could NEVER go back to buying shop bread rolls or loaves! This is the first bread maker I have owned, and I am pleased to say that it is extremely easy to use, and makes very tasty bread. The only thing that I would recommend, is that you use a bread improver otherwise the bread is a little bit dense. We bought this bread maker after doing some online research. Although a bit more expensive than others in the market its features and ease of use made this an easy choice.\n\nIt is used daily and make a consistent good quality loaf and we are sure that this will continue to do so. Tower are so confident of the quality of this bread machine that they offered a three year warranty. We bought this bread maker after doing some online research. Although a bit more expensive than others in the market its features and ease of use made this an easy choice. It is used daily and make a consistent good quality loaf and we are sure that this will continue to do so. Tower are so confident of the quality of this bread machine that they offered a three year warranty. Bought bread maker in sale considerable reduced, would not have bought it at RRP. There were 3 other Bread Makers on offer but what I liked about the Tower was the sleek design,, square shape with black top and stainless steel sides. Liked the bread menus especially the gluten free option. A little bit noisy but guess that is to be expected. I have made some lovely bread and still experimenting. I am very pleased with the product. Overall I am quite happy with my breadmaker machine. It took me a while to get used to the different quantities of the ingredients and some of them differ from my previous machine of which I had for many years.\nMy only complaints are : \nThat there are no recipes in the user guide for inspiration.\nThe fruit dispenser did not work when I tried to make a sponge cake - none of the cherry & coconut ingredients were added - they got stuck in the dispenser box, but I assume I may have put too much in the box.\nThe 500g size loaf does not rise very much at all - or is it not supposed to, the slices are not even big enough to make a sandwich with - the only decent size is the 700g. Tower Digital Bread Maker with Nut Dispenser, shame about the manual. Bread-maker looks good and works fine, but the instruction manual is absolutely dreadful, it really needs some work on it, and frankly spoils the baking experience! I have never used a bread maker before and found this so easy to use. Even the first time I used this machine I had excellent results. I am gluten free so that is why I bought this machine. I find it very good although the gluten free recipe you get in the book needs a lot more liquid the first loaf I made was a disaster, once you get the recipe right the loaf turns out fine. THIS BREAD MAKING MACHINE IS SO EASY TO USE,THE NUT DISPENSER IS BRILLIANT.I MAKE A FRESH LOAF EVERY DAY.HOME MADE BREAD IS SO MUCH BETTER THAN SHOP BOUGHT AND IS FANTASTIC HOT STRAIGHT FROM THE MACHINE. It is great bread maker and as I have used others before I find this the best one I have had thank you. Great machine a lot better and improvement to the old bread maker I had which packed up\n. Treated myself to a new bread maker, could not believe the price, I had expected to pay double. When the machine arrived, I made a quick loaf and within ninety minutes I had my first loaf sitting on the side. This machine is quick, very easy to use, well built, overall brilliant value for the money. I would rate this machine five stars, if you are thinking about buying a bread making machine then this is the one you should go for. Well done Tower for this unbelievable bargain. does what it says and looks good on the work top and makes nice bread\n. Great machine, easy to use comes with a good selection of recipes with different loaf size options, and the quick loaf option is perfect. this is the second bread maker we have owned and this one is the bees knees\nwhat it says on the box switch on and it happens never saw anything so simple\nthrow the ingredients in in the prescribed order select the program and switch on and wait for the bread Yum Yum! !\n\n\nstill no 50% discount code and where can I use it. throw the ingredients in in the prescribed order select the program and switch on and wait for the bread Yum Yum!! still no 50% discount code and where can I use it. This is a fantastic product. Makes perfect bread every time. I have had other bread makers in the past but none of them come close to tower. Super machine, very easy to use, I have had bread makers in the past, but this one is just the best. Straight out of the box, I had my first loaf in under ninety minutes. The build quality is fabulous, the design will fit in to any kitchen. Well done Tower, great value for the money. Ten out of ten for this machine.